When staying in a city for more than a few days I like to have my own space. I like to set up a temporary home where I can laze around and not worry about making a mess. I also like to make myself snacks and stock up my fridge with booze and local produce. This is why I love staying in apartments and I was really pleased to be staying in Central Apartments in Ljubljana during my trip with The Travel Mob. I was staying alone so was keen to have somewhere central and with a cozy feel. There were some large apartments available but I didn’t want to feel like I was rattling around in a huge space all by myself. The apartment I chose couldn’t have been better. I opted for Mija Apartment, a small but modern studio apartment just 500 meters from the main square. The best word to describe my apartment is ‘cute’. I think I actually tweeted that it was ‘super cute’ as soon as I arrived. I apologise if ‘super cute’ isn’t the kind of vocabulary you’d normally use to describe an apartment but t’s honestly the best description. The whole apartment is pretty small but it’s open plan so doesn’t feel cramped. An open-plan living area and kitchen greet you when you walk through the door. The kitchen is stocked with every appliance you could need and there is a table big enough to seat four. There’s also a comfortable sofa, a writing desk and large TV in the living area. The bathroom was small but clean, bright and modern with a washing machine and powerful shower. There was a large storage cupboard by the front door with cleaning products, an iron and hairdryer and plenty of hooks and space for shoes. The bedroom was upstairs but with no door. I actually liked this because it made it feel more spacious and as I was alone it didn’t matter about privacy. The bed was comfortable and there was loads of storage space as well as shelves and mirrors. I particularly liked the skylight which was great during a couple of thunderstorms we had. There was also air-conditioning and a small TV in the bedroom. Mija was located about 20 meters away from Dragon’s Bridge which is the perfect location. Everywhere was a 10 minute walk away making it really easy to pop back and grab a drink, get changed or freshen up. As I was alone, I didn’t want to be so far out that I’d be walking down deserted streets during the evening. The apartment is down a back street but it’s all residential and felt very safe. I was travelling in Ljubljana during the World Cup so there were a few evenings when I could hear people on the street or my neighbours coming home late. This didn’t bother me but a light sleeper may consider ear plugs. Central Apartments were amazing. The booking process was quick and easy and I was asked to give them a call once I arrived and was 30 minutes away. I was picked up from the airport by Go Opti so called them as soon as I was on my way. Ana was waiting for me outside the apartment. Despite it being almost midnight, she welcomed me with a huge grin and made me feel settled instantly. After a quick tour around the apartment we sat down with a map and she showed me how to get everywhere and got me set up with the WiFi (which was brilliant). A few minutes after Ana left she called me on the house phone – which I was told I was welcome to use for local numbers – to see if the hot water was working OK. I really appreciated this because my pet hate in hotels is not having hot water. I’ve even stayed in really nice hotels and had to suffer a cold shower. The apartment was spotlessly clean with everything I could possibly need. It was all very well thought out with instructions translated into English and a hefty folder filled with local information, maps and guides. I had to pay a fee of €21 for a night arrival which applies between 9pm and midnight. If you arrive after midnight it’s €38. This fee was collected by someone from the office just before I left. When leaving I simply placed my keys in the letterbox and my Go Opti transfer collected me. I’m used to staying in apartments that are actually people’s homes so has a little bit of their personality around the place. Central Apartments are different in that it is somewhere between a hotel and a person’s home. The towels and sheets are branded with the Central Apartments logo and miniature toiletries are left for you in the bathroom. There are no trinkets around or books or DVDs. There are no condiments in the cupboards or anything in any draws. This isn’t really a good thing or a bad thing, more an observation and possibly good for anyone who feels uncomfortable staying in a stranger’s home. 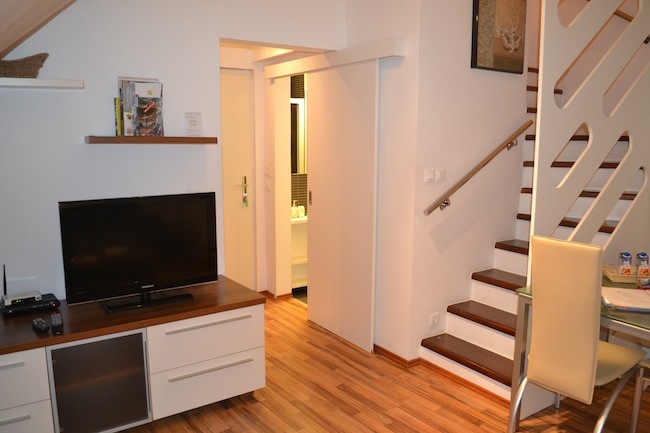 [alert type=white ]Mija Apartment is available from €65 per day for two people. 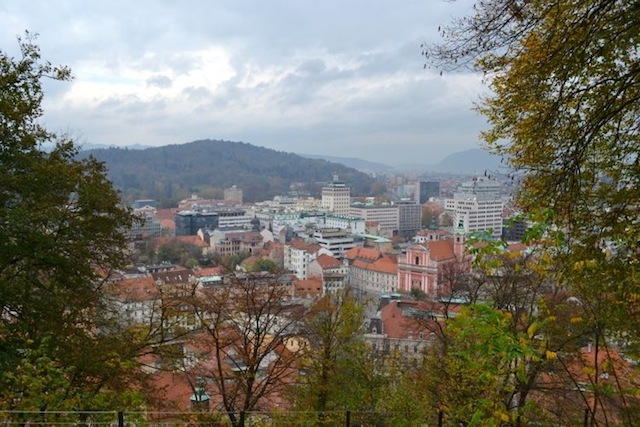 I was travelling to Ljubljana as a guest of Visit Ljubljana and this stay was courtesy of Central Apartments Tour As. As always, all opinions are my own but I’d like to say a huge thank you to Visit Ljubljana for hosting our group, I had a fantastic time in your beautiful city. It’s a pleasure to read that you enjoyed your stay in Mija appartment. Being its owners, we do our best to make it as comfortable and easy-to live as possible. We took note that some available books would be welcomed… Thank you for this suggestion ! We are also happy that you loved Ljubljana, as we did years ago, enough to settle here ! Have fun and pleasure in your next travels, but don’t forget to come back to Slovenia ! It looks like a very pretty apartment! How did you find Slovenia as a whole? I absolutely loved Slovenia. It’s such a beautiful country.